Independent scientific research has always shown and proven that electromagnetic signals in the radio frequency band affect the human body in a negative way. This depends, of course, on the frequency itself, its duration and its intensity. Microwaves are especially harmful. It does not matter if they are ionizing or not, if they are heating tissue or not. The military did extensive studies, already in the 1950’s, that proved that microwaves (they were using microwave dishes) were very harmful. But commercial companies don’t care about your health, and microwaves made their entry into our every day lives. Microwave ovens were a convenience, but also a danger as they do leak microwaves of high intensity. Then came the cellphones and cell towers. The medical industry has proven, again and again, that cell phones damage the brain tissues, the blood-brain barrier, and lead eventually to brain tumors. Cell towers themselves are huge transmitters of microwaves. Now the smart meters are being installed on our property, transmitting pulsed microwaves on a constant basis, bathing our environment, and this includes inside your home, in a sea of harmful microwaves. Some people are more sensitive than others to microwaves. Some have vague symptoms of ill-being after a smart meter has been installed, while others are so sensitive that they are suffering from headaches, not being able to sleep, and other bodily reactions. I am getting more and more customers who are buying orgonite for counteracting the effects of the smart meters. They tell me it works. Of course, orgonite does not block the microwaves, or any other EMF’s themselves. In my opinion orgonite has two effects. First, when placed nearby a device that emits EMF’s, such as a computer or TV, and near a smart meter, it transforms the etheric side of the electromagnetic field that this device emits. All electronic devices emit a physical electromagnetic field (and waves), but also an etheric, or energetic counterpart that is harmful to our etheric or energetic biofield (of the human body) because electrical devices are artificial. When an orgonite piece in placed in this field, it transforms this etheric counterpart in a more natural quality that is friendly to the human biofield. 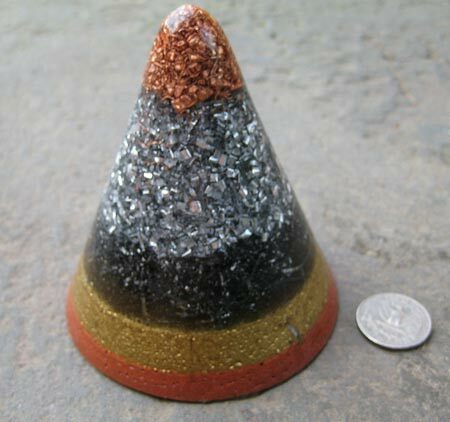 Second: When orgonite is worn on the body, and thus it is inside one’s own biofield, it transforms this biofield by cleaning up stuck energy and making it more positive, and at the same time it strengthens the biofield a lot, making it much more resilient to incoming harmful energies, including the EMF’s and microwaves. Several customers have told me that since they had orgonite in the house, their physical condition has improved a lot, and they can tolerate the presence of electronic devices much more than before. As smart meters are now becoming common place, it seems that orgonite will play an important role to keep our health up as much as possible. To read more about what orgonite is and does, go to my website Soul Guidance. One of my orgonite cones. This entry was posted in healing, orgonite and tagged cell phones, cell towers, dangers, effects, emf, energies, energy, hazards, health, microwaves, orgonite, privacy, problems, radiation, risk, safety, smart meter, smart meters, smartmeter, smartmeters. Bookmark the permalink.